Our object this week is an original microphone used in the recording studio at APH from around 1940. APH began recording talking books for the National Library Service in 1937. The omnidirectional dynamic microphone was developed at Bell Labs in the late 1920s. 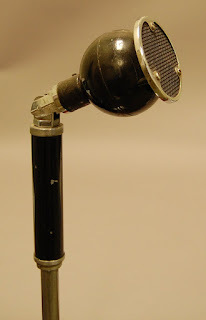 Western Electric developed this “mic” in the late 1930s that was omnidirectional to 15 kHz. Called the 630A, it was better known as the “Eight-Ball,” resembling a black billiard ball used on a pool table. The "acoustic baffle assembly,” the round grill mounted on top of the body of the microphone, converted an omnidirectional mic into a semi-directional mic useful for studio work at APH. Caption, Western Electric “8-ball” microphone.